There's more time to register to attend FIRM 2018: a conference organized by early career researchers for early career researchers. FIRM 2018 is a conference organized by early career researchers for early career scientists, entitled “Future Investigators of Regenerative Medicine” (FIRM). FIRM has achieved huge success in bringing young researchers together from across the world, enabling them to share their research and provide a platform to learn, interact and network with world-class leaders in the field of regenerative medicine. This year we are celebrating 5 years of FIRM with a range of world leading experts in different areas of regenerative medicine and tissue engineering. In addition tailored workshops will be run to allow delegates to go through the different aspects they would need to consider to get a therapy from bench to bedside. This will be supported by a panel of mentors from both academia and industry. 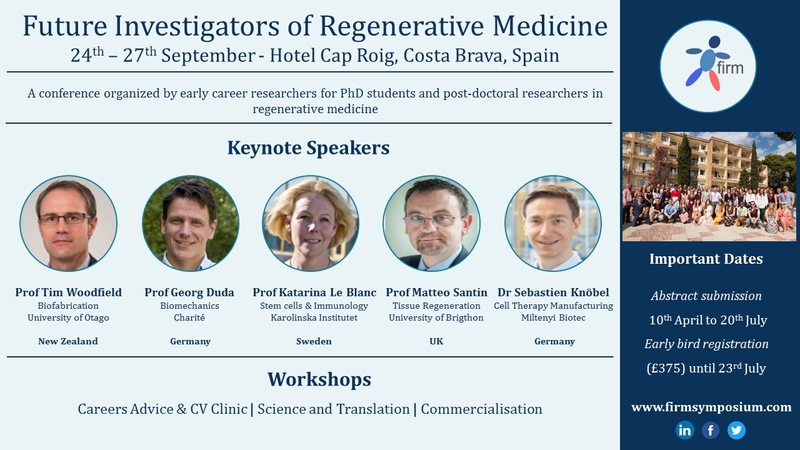 Join us for the 5th anniversary of Future Investigators of Regenerative Medicine (FIRM 2018) to be held at the Hotel Cap Roig in Costa Brava, Spain from 24th to 27th September 2018. We highly encourage you all to join us and to share your research and network with other early career researchers. The conference covers a wide range of topics, including basic biology, cell and gene therapies, tissue engineering, biomaterials, enabling technologies and commercialization. Please, submit your abstract using the online abstract submission system by 23:59, 20th July 2018. Notification of your allocated presentation will be by beginning of August 2018. Please note that early bird registration is still open for a rate of £375 which includes 3 nights accommodation on a sharing basis and meals on a full board basis. Supporting regeneration with innovative biomaterials: read our exclusive interview with keynote speaker Professor Matteo Santin!